instead of you finding a phone number. Like something out of a James Bond movie, watch your cab arrive on your phone, in real time. The only app that still let’s you pay by cash or credit, in the Taxi, after your ride. Choice is a good thing. Now you can book your rides in advance, plan ahead and rest easy knowing your ride is ready when you are. Other apps charge booking fees or have prices that can go up at any time. Ours uses regular taxi rates plus 0 on every ride, any day, any time. With other Apps, your ride is in someone else’s hands. Ours is the only one to give you peace of mind by knowing exactly what taxi company you’re getting a ride with – the largest in Seattle. Have no doubt – Always go with yellow. 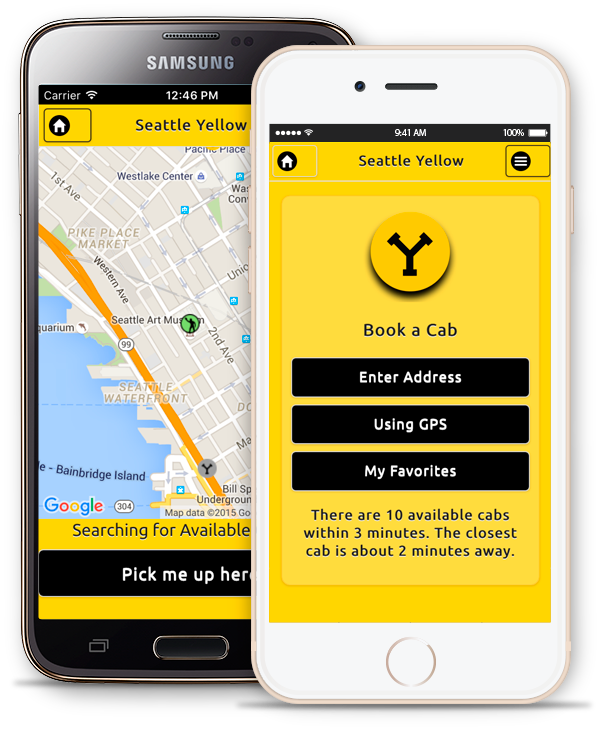 Get the Seattle Mobile Cab App Today!